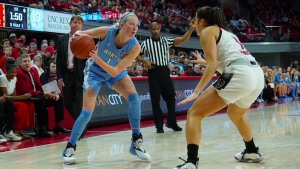 RALEIGH, N.C. — Stephanie Watts scored 20 points to help North Carolina upset No. 7 North Carolina State 64-51 on Sunday, handing the first loss to the nation’s last unbeaten team. Janelle Bailey added 16 points and 13 rebounds for the Tar Heels (14-9, 5-4 Atlantic Coast Conference), who knocked off top-ranked Notre Dame last week. This time, they went on the road against a longtime rival in front of a sellout crowd and took over in the third quarter to earn a fourth straight win. N.C. State (21-1, 8-1) came in leading the ACC and as the only unbeaten team in Division I on the men’s or women’s side. But after leading 32-31 at halftime, the Wolfpack went cold – going more than 10 minutes without a basket as the Tar Heels gradually built a double-figure lead. UNC: The Tar Heels shocked everybody with their win against the then-No. 1 Fighting Irish last Sunday, with Watts proclaiming afterward: ”We’re a better team than what our record shows.” It’s hard to argue now, after two huge wins against highly ranked teams in a week. N.C. State: The Wolfpack had savored a remarkable start that stood as the best start in school history and the program’s highest ranking since January 2000. That had come despite injury concerns that included the loss of top scorer Grace Hunter to a knee injury. Leslie, Aislinn Konig and the rest of the Wolfpack had kept winning before finally coming up cold against UNC’s recent surge. Now the trick is regrouping with a tough schedule ahead. N.C. State: The Wolfpack will get plenty of travel miles in February, starting with Thursday’s game at No. 24 Florida State.